This Tropical White Wine Sangria is the perfect drink for any occasion! Fruity, bubbly and so delicious, this easy, crowd-pleasing recipe is super refreshing and comes together in minutes. 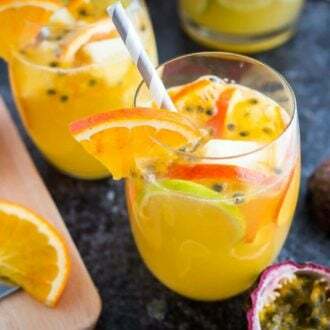 In a pitcher or punch bowl, combine the white wine, sparkling orange lemonade, passion fruit puree, orange juice, orange slices, lime slices, and pineapple and stir well. Chill until ready to serve but not longer than 30 minutes. When ready to serve, fill glasses with ice. Divide the sangria, with the fruit, among the glasses.